Jim and Gloria along with their pals BooBoo and Buddy cruising the Great Loop. Can you tell Hannah Point was my absolute favorite? Hanna Point was our last stop - our 11th adventure and where we found most of our favorite animals, all together in one spot. Add to that another perfect weather day and my personal introduction to my new best buddy, Stinky. Gloria and her new best friend, Stinky. I was so lucky! 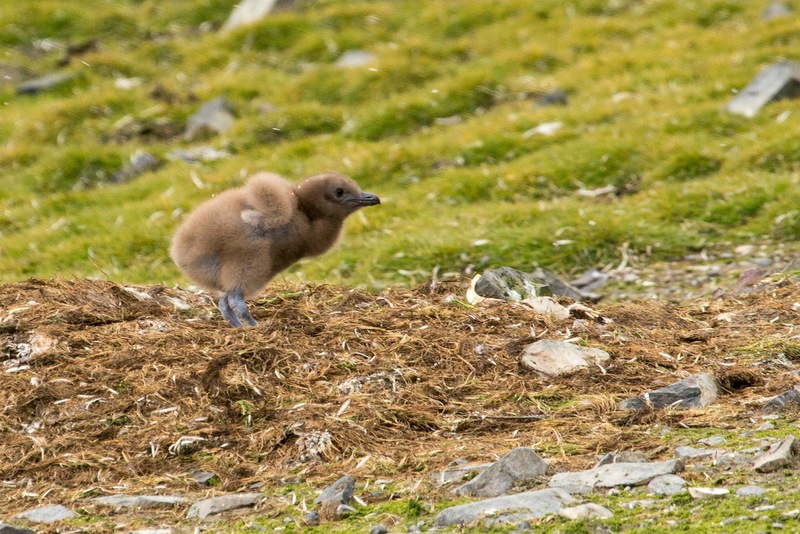 As you probably know, the best photographs are taken at eye level and the baby Penguins are pretty low to the ground! I knelt down to get a shot of the cutest little guy. He saw me and thought I was pretty interesting, so he came on over and pecked on my jacket, my pants, boots, gloves - you name it and then he tried to sit under me, like his was his Mama! May I bring him home, please! The view of what the Penguins see! 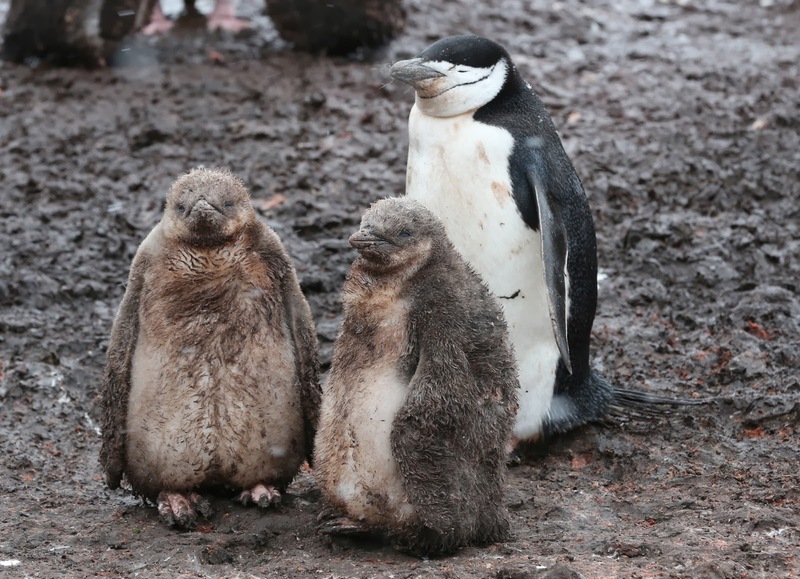 So far I haven't mentioned Penguin guano, aka Penguin poo. The smell is permeating and in fact, we hung our jackets outside our cabin door because exposure to our outdoor clothing permeated everything. But Penguins are awesome, that's all I can say. Despite the aroma, I loved every moment with these sweet and darling creatures and swooned whenever they approached me. I love this shot...leaning on Mom. 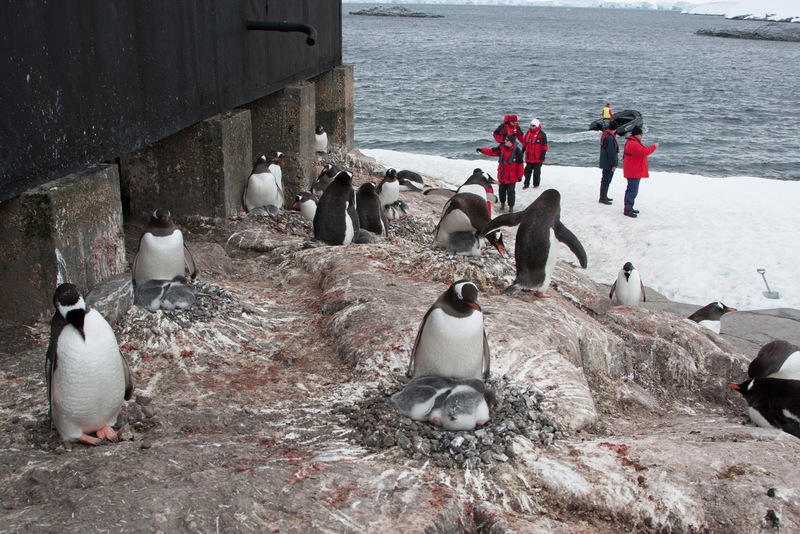 Hanna Point is the home to thousands of pairs of Penguins. Note the fluff of this baby is giving way to a feathered coat. The feathers are water-proof and provide protection for this baby. With only a fluffy coat, they are vulnerable to rain and cold weather. When they are first born, they are protected by hiding under their mother or father, but as they grow larger, they become vulnerable to the weather. Seals share the islands with the Penguins. Parents feed the babies by regurgitating the krill, squid and fish they eat themselves. The adult Penguin swallows the food and saves it for later, changing into a form the chicks can eat. The Skua is a seabird who scavenges the carcasses at the Penguin colonies and at times taking live chicks. 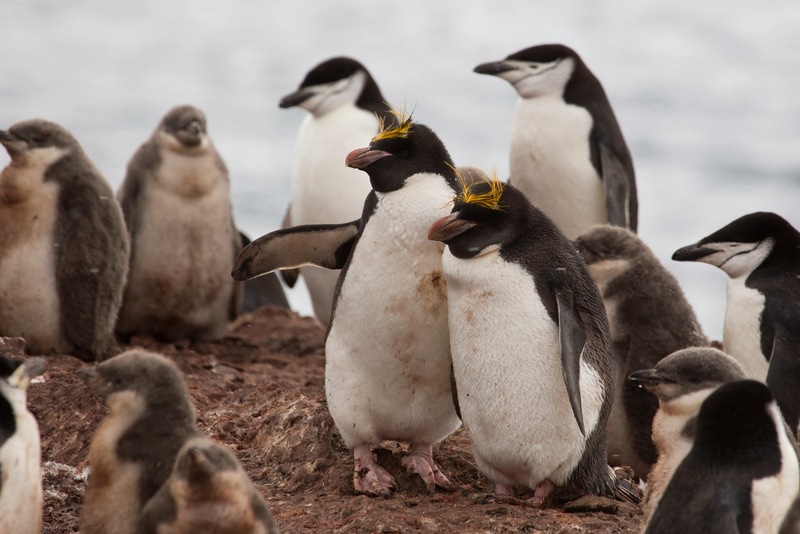 As noted earlier, the presence of humans has a positive affect on Penguin rookeries, as the Skua's are frightened of humans and are less willing to steal Penguin chicks from their nests. 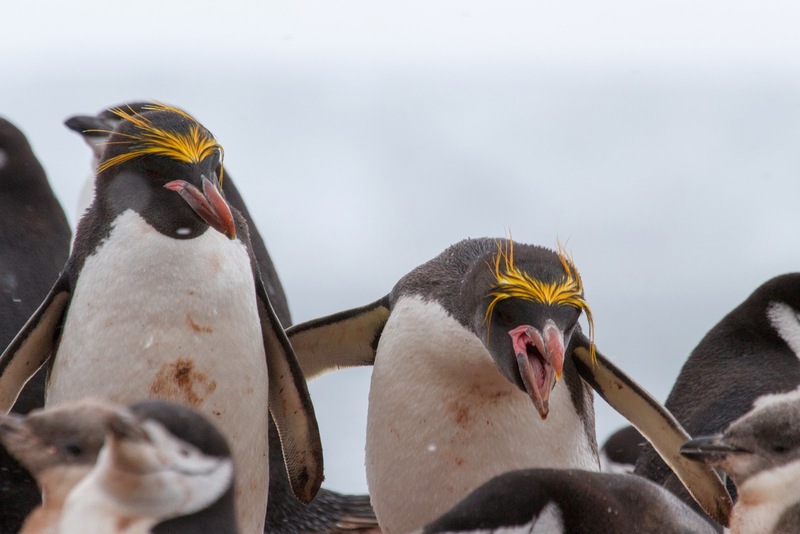 Two Macaroni Penguins are living among this group of Chinstraps. 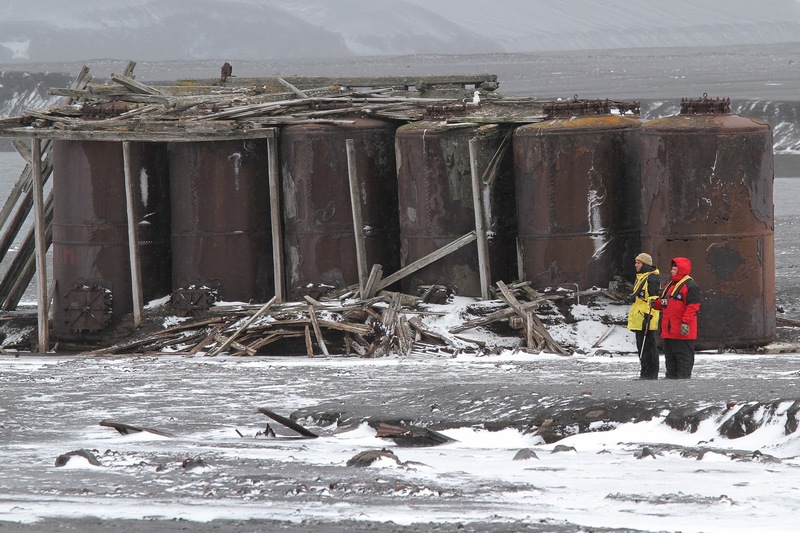 Deception Island is one of the safest harbors in Antarctica. The island is the caldera of an active volcano, which caused serious damage to the local scientific stations in 1967 and 1969. The Island previously was the home to a whaling station and is now a tourist destination and scientific outpost. Since the early 19th Century, Deception Island was a favorite refuge from the storms and icebergs of Antarctica. Sealers used the haven, but the volcano destroyed most permanent facilities. Whaling operations followed in the early 1900's. The whale blubber was processed on the ships and the carcasses were boiled down in large iron boilers to extract additional whale oil and stored in the iron tanks seen here. As many as 1000 whale carcasses a day at the peak were boiled down at this site. Whale oil prices dropped during the Depression and the station was abandoned in 1931. Thirty-five men are buried in the cemetery along with a memorial to others who were presumed drowned. It is amazing to think that less than 100 years ago, men were hunting down and killing these beautiful and gentle creatures. We hiked up the sides of the cauldron to Neptune's Bellows. Our guides knew we were looking for a bit of exercise and assisted us in finding interesting sites to visit here and where ever possible! 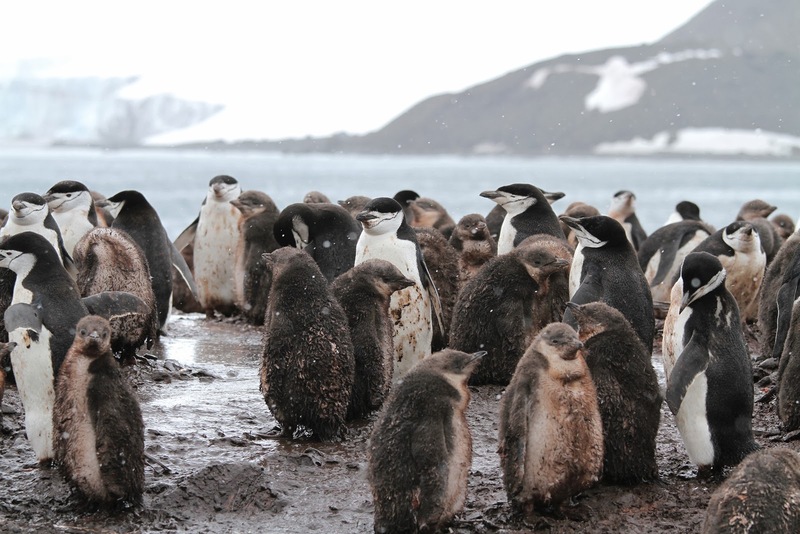 Today the remains of the whaling station set a desolate backdrop for a large Chinstrap Penguin Rookery with up to 100,000 pairs. Also, because of the volcano, the black sands and water temperature can warm up to 70 degrees. On the day we visited, Andy assures us neither the sand nor water temperature were any where near 70 degrees. Then why, may we ask, did he and others go swimming and take the Polar Plunge? Vernadsky Station is the Ukrainian research base located on Galindez Island. The base was originally set up by the British in 1947. 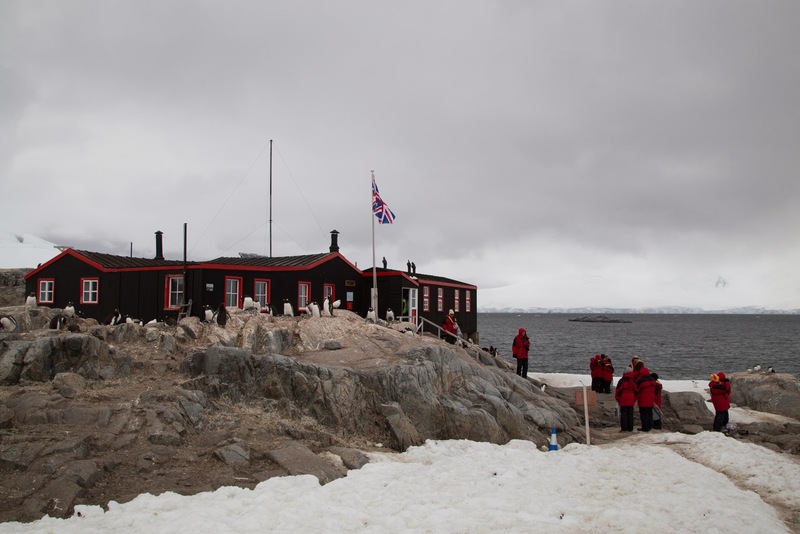 The main hut was built on the sight of an earlier expedition hut that was named after Sir James Wordie, a member of Shackleton's Expedition, as he visited the site while it was under construction. The British renamed the base Faraday Station in 1977. The Ukrainians took over operation of the base in 1996, when it was sold to them by the British for one pound. Had the British not sold the base, they would have been required to disassemble the base and remove it entirely from Antarctica. The Ukrainian team spend 12 months working at the station. They were working on various projects including meteorological and seismic studies. Few people spend an entire year in Antarctica. One can only imagine how long winter must seem in this desolate environment. You may recognize the guy at the bar, yucking it up with the Ukrainians. This photograph was posted on the wall of the Research Center along with many other historic photographs. Surprisingly, most of the original photos from the British remain. There was a small store at Vernadsky as well. T-shirts and patches were the only merchandise available. No danger of doing too much shopping in Antarctica! Antarctica - More Penguins, Cormorants, Seals, etc. 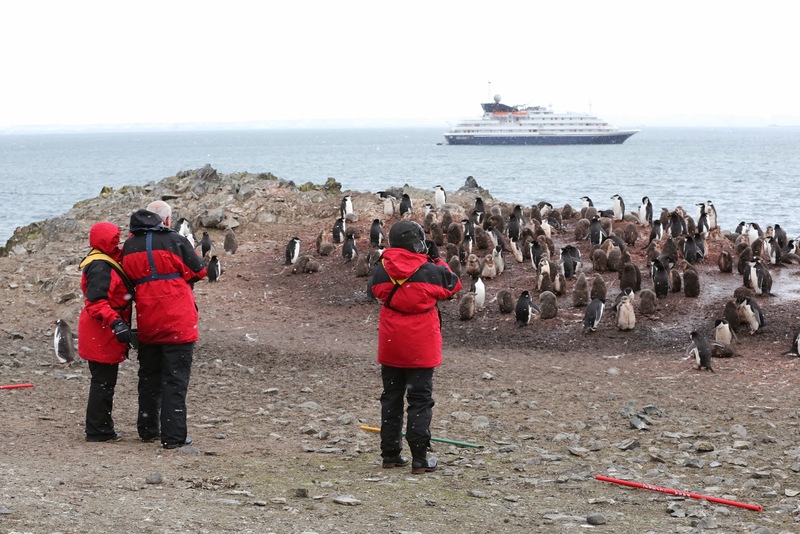 So far we had seen Gentoo, Chinstrap Penguins and the lone Emperor Penguin. Finally, we were able to see Adelie and Macaroni Penguins. Before coming to Antarctica, all Penguins looked alike. Not anymore! They have very distinctive qualities. 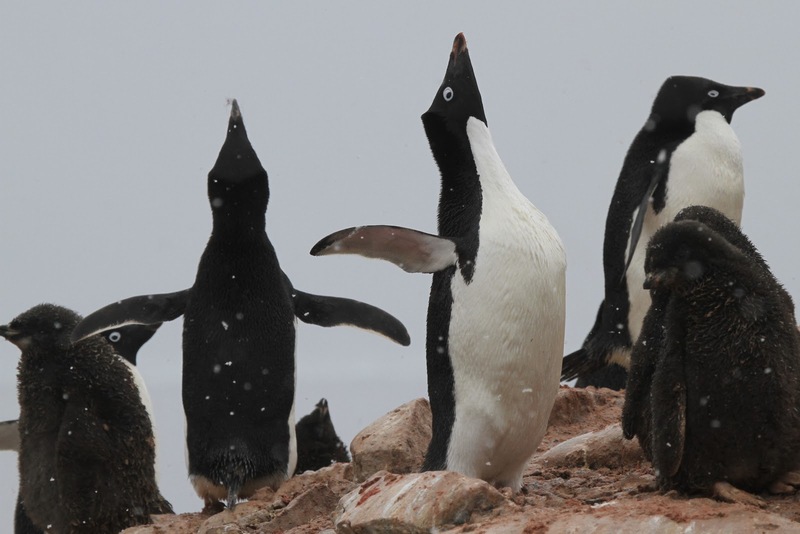 Adelie Penguins are very distinctive with black and white plumage, white eye rings, pink feet and black and pink beaks. They grow to about 24 inches in height. 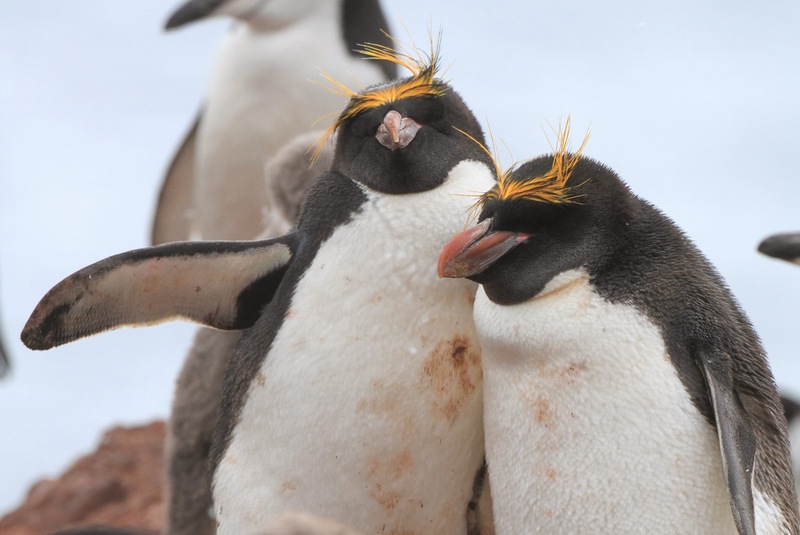 We also saw the darling Macaroni Penguins as seen in the movie Happy Feet. 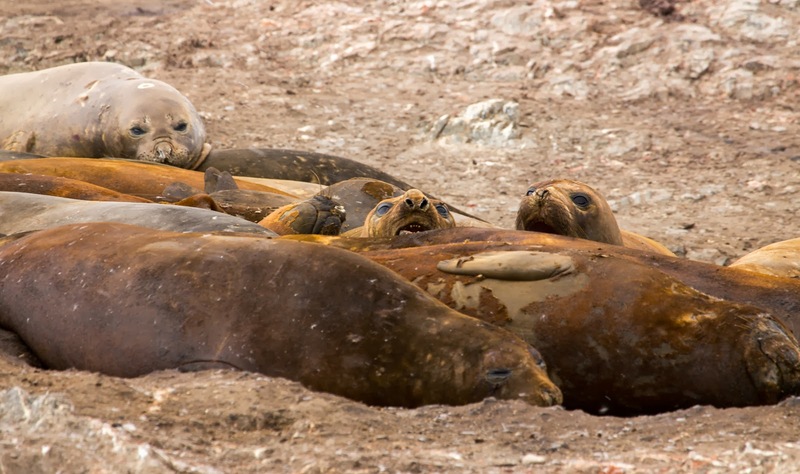 Elephant Seals were hunted to near extinction at the end of the 19th Century, but their numbers have since recovered. As you can see, they molt together in groups. We had been anticipating the beautiful Lemaire Channel, along with the Pleneau Bay. This area is one of the top tourist destinations in Antarctica. 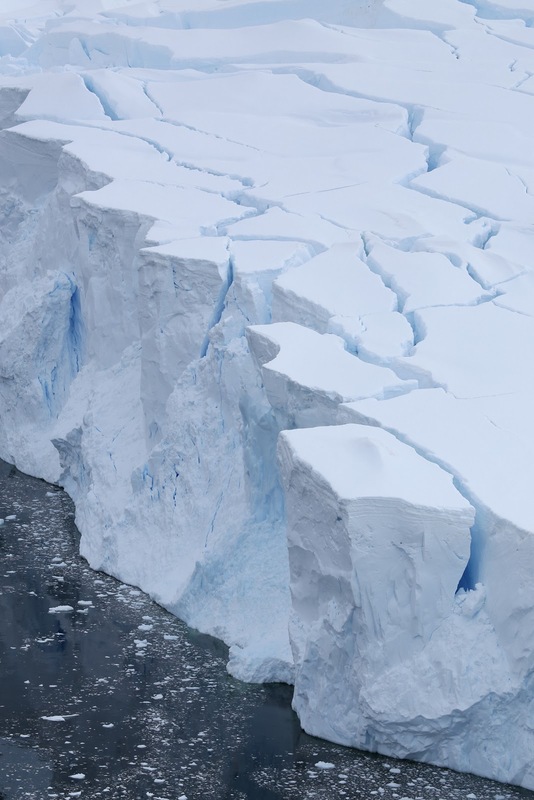 There are steep cliffs that hem in the iceberg-filled passage. This passage was originally discovered in 1873. 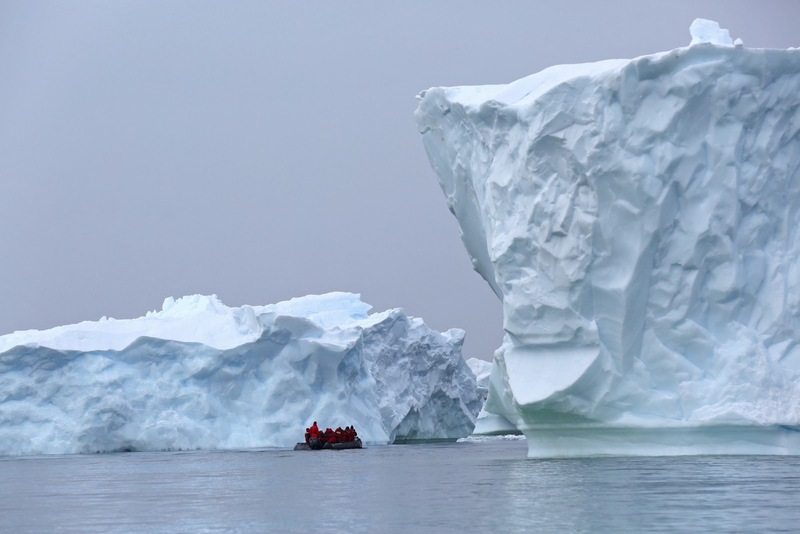 Icebergs fill the Channel, creating a beautiful view along with a challenging cruise....and of course there are the incredibly beautiful icebergs! 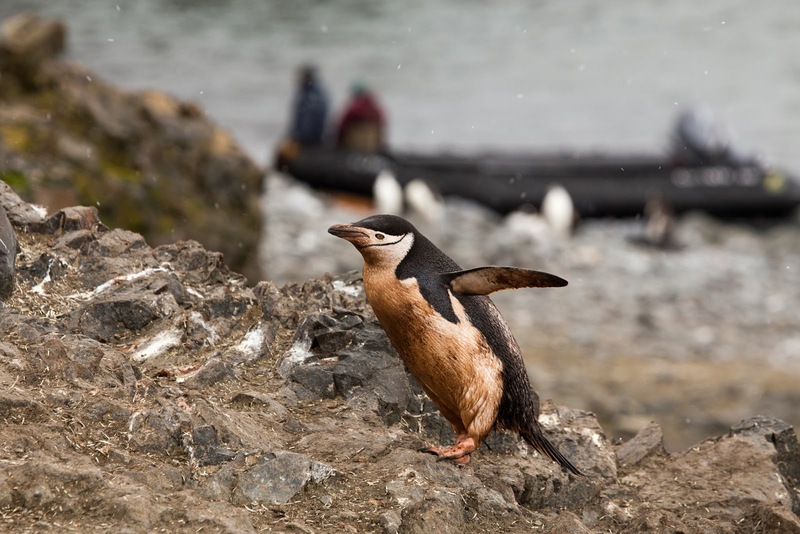 The sighting of this Penguin was an absolute surprise! We were eating dinner and Iggy came over the ship intercom, saying an adolescent Emperor Penguin had been sighted nearby they he felt we needed to go immediately, if we wanted to see him. We all leaped our of our seats in the middle of dinner and ran to our cabins to put on our gear. Penguins annually go through a moulting process, during which period the Penguin loses its feathers and they are replaced with new waterproof feathers. During this molting period the Penguin is unable to go to see and as a result is unable to eat during this time. This is a very stressful period. 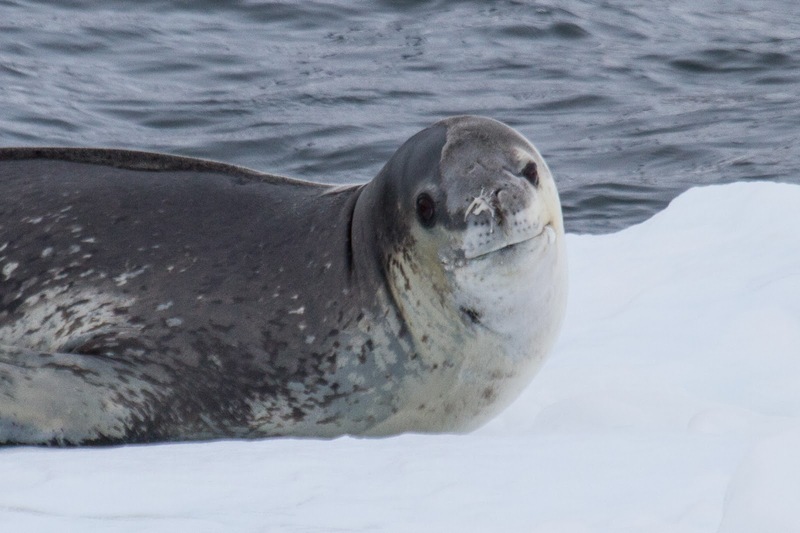 Crabeater Seals are only found in Antarctica. 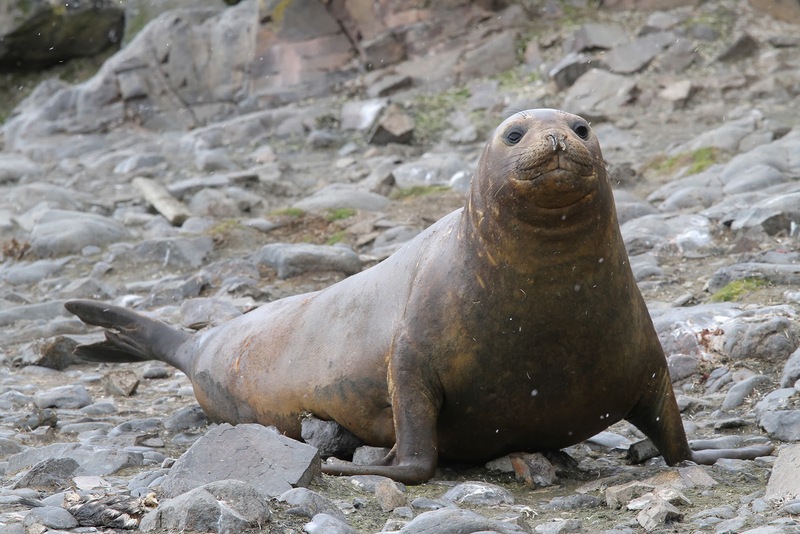 Often these Seals have scars and other injuries that are velieved to been caused by an encounter with either Killer Whales or Leopard Seals. 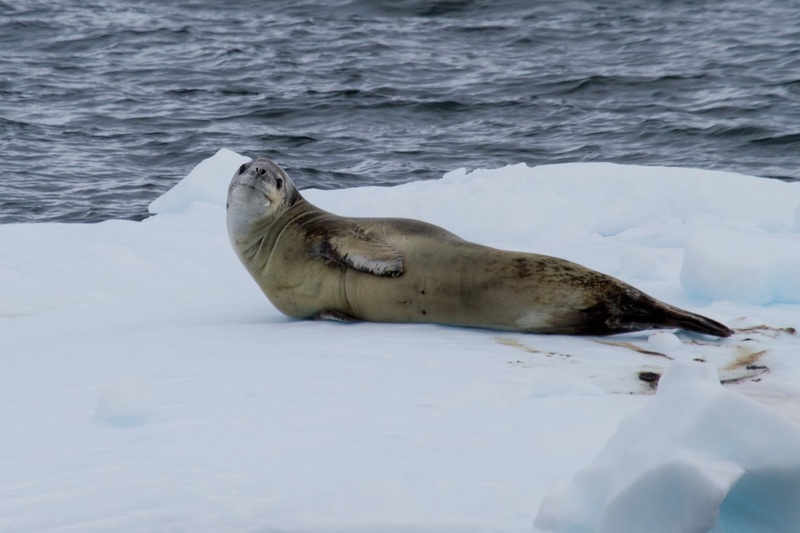 We saw many Crabeater Seals dozing on ice flows and often were able to see these guys close up. Port Lockroy was established in 1944 by the British to report on enemy submarine activity. Ultimately there was none, though they did provide weather reports. The base continued as a scientific base after the war under the auspices of the British Antarctic Survey. Port Lockroy was closed in 1962 with the building falling into disrepair. The UK Antarctic Heritage Trust renovated the building in 1996 and the site was designated as a Historical Site and Monument 61 under the Antarctic Treaty. We feel very fortunate to visit any of the few research centers in Antarctica. There is a limit on the number of people who can be ashore at one time on the island, so the group was divided into 2 groups. There is a gift shop (one of the few places to buy gifts) and a museum. 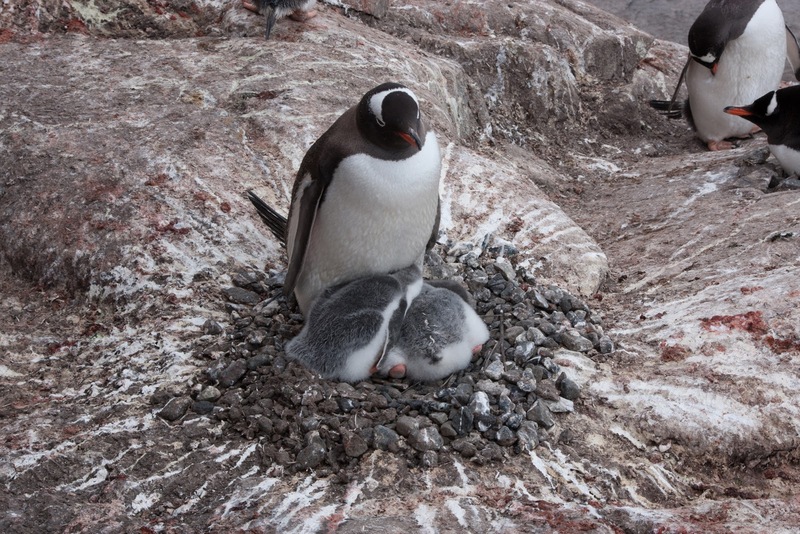 The Penguins have nested under the building, outside the building and all over the island and there ongoing research on the island, relating to the Gentoo Penguins. 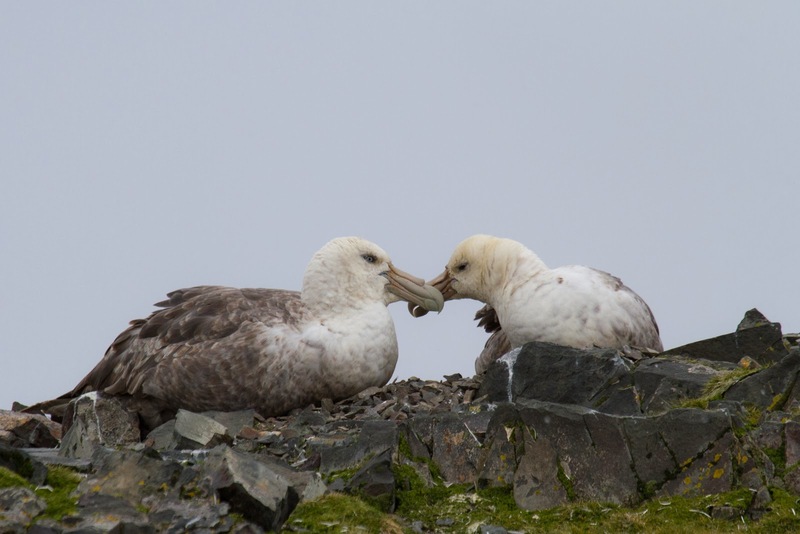 Interestingly, one of the research studies found that the baby Penguins are safer in this environment as the predator birds (Skuas) are less willing to prey upon the babies with humans in the area. So glad to see visits by humans are positive! 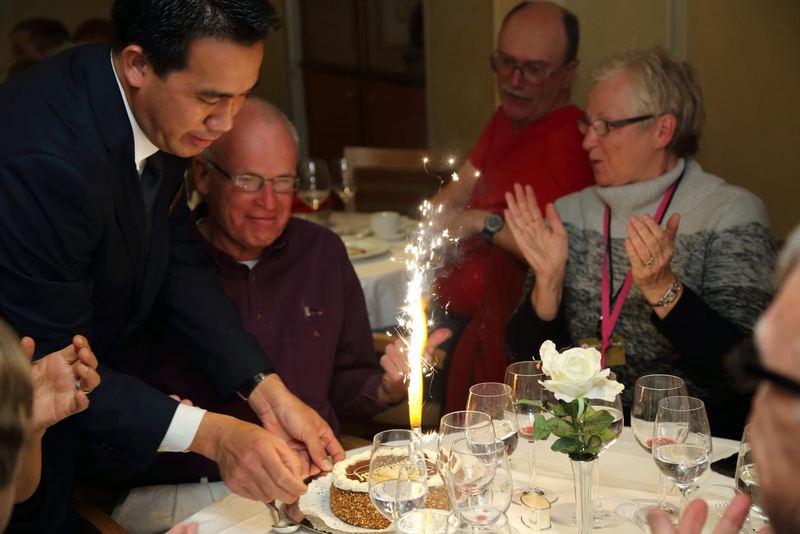 While we were on the trip, we celebrated Andy's birthday. My brother-in-law, Andy and my sister, Marcia were with us on our trip. Marcia and Andy live in Fort Wayne, IN, so we don't see them as often as we would like. We had a great time together and can't wait for the next trip we can enjoy together. Neko Harbour is beautiful. The morning we landed, there was no wind and the reflection of the mountains and glaciers on the water was incredible. Chris, one of the biologists is a former accountant who turned his avocation of photography into a vocation. 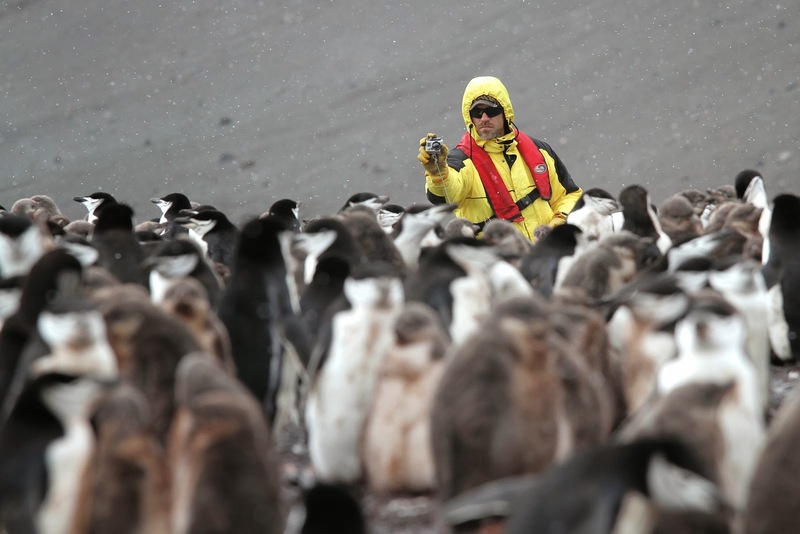 He spends every winter (summer in Antarctica) as a guide in Antarctica. As you can see, Marcia has a fancy plastic Ziploc bag over her camera. Jim with his red hat and Andy with his green safari hat are receiving instruction along with the others in the Zodiac. Iggy is the guide in yellow and he is explaining what they should see and where to go....and not go. 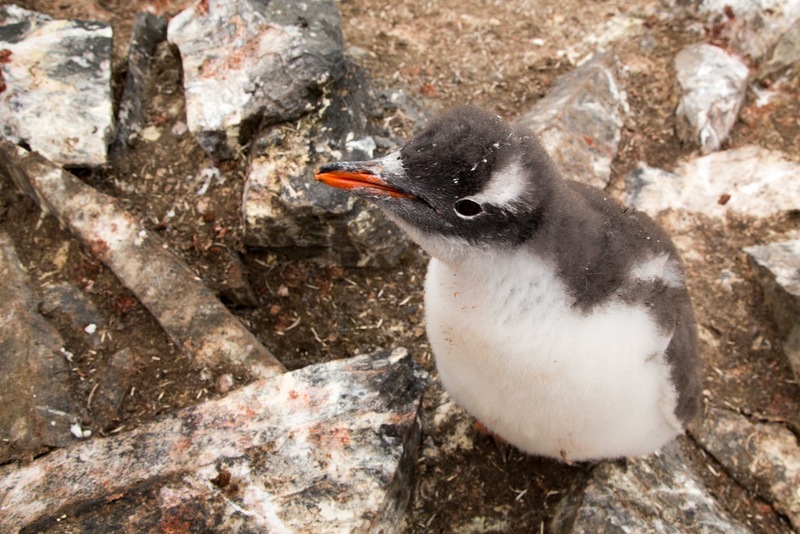 This male Gentoo doesn't know the mating season is over. The glacier, which is about to calve, is in the background below. The glacier is taller than the sailboat! Movement of glaciers in the Transantarctic Mountains have been measured in the range of 2 to 6 feet of movement per day. The crevasses vary in color, but are often a brilliant blue. As with water, the color is caused by the absorption of both red and yellow light. This leaves light at the blue end of the visible light spectrum. From the surface, snow and ice appear uniformly white. This is because almost all of the visible light, striking the snow or ice surface is reflected back. Ice or snow layers act as a filter. If it is thin, all the light makes it through. If the snow or ice is thicker, mostly blue light makes it through. Ushuaia - still on the way to Antarctica! Buenos Aires - on the way to Antarctica!